The scale of ‘Under 5 Mortality’ (U5M) in Bihar is huge: 58 deaths for every 1000 live births, nearly 45 percent of all under five children are underweight and 49 percent of them are stunted. The disturbing figures of U5M may reflect the poor state of human development indicators but the numbers don’t tell the whole story. The UCDU5M project is funded by the Bill and Melinda Gates Foundation and is being pursued by Vihara Innovation Network (us). It is approaching the problem of child mortality through User Centered Design wherein it aims to identify challenges and create solutions by Interacting with the rural populace; understanding their perspective of the health system and observing behaviours and interactions within the given environment. It has three phases i.e. 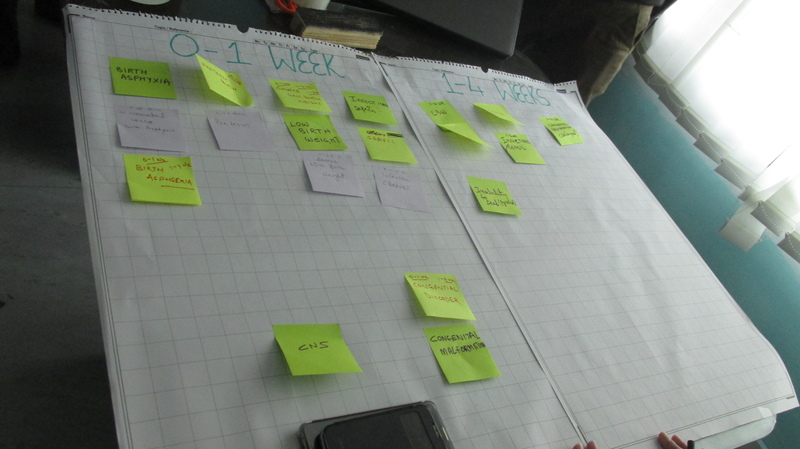 field testing and prototyping interventions to ensure scalability. The first phase which is primarily dedicated to knowledge building is currently in progress. After two workshops framed around the question of “vulnerability” to develop a framework to systematically understand the word in context of children in Bihar, about a month spent on reviewing literature and after long exhaustive sessions of brainstorming with our partners M4ID (all the way from Helsinki! )- we came up with some tools that would help us identify the underlying problems and causes. These were refined to a set of four intensive activities that would comprise the third workshop. These activities were built around some pertinent question that emerged from the previous workshop; How does risk manifest in Bihar? What Environmental, Systemic and Cultural factors perpetuate vulnerability and how? How do people make decisions around care seeking? What are the markers of health and vulnerability? The activities were designed such that they would allow the transfer of knowledge from our health partners CARE in Bihar without requiring us to analysis hoards of data that they have collected on field. We arrived at Patna, on the damp rainy afternoon of 6th September, with templates of the activities and a list of prospective participants but with everyone’s busy schedules it would be impossible to sit all of them down at the same time and place. We soon realised that we would have to conduct the activities with smaller groups. The first round of the workshop happened at the Vihara office in Patna with three enthusiastic participants from CARE; a State Programme Manager and two of his District Officers.We started off at 11:00 am after brief introductions and casual chit chat over tea. The objective of the first activity was to understand the distribution of mortality through different stages of life up till 5 years of age and to identify the risk factors (mostly clinical) that surface at each stage as well as to recognize the preventable and non-preventable ones among them. 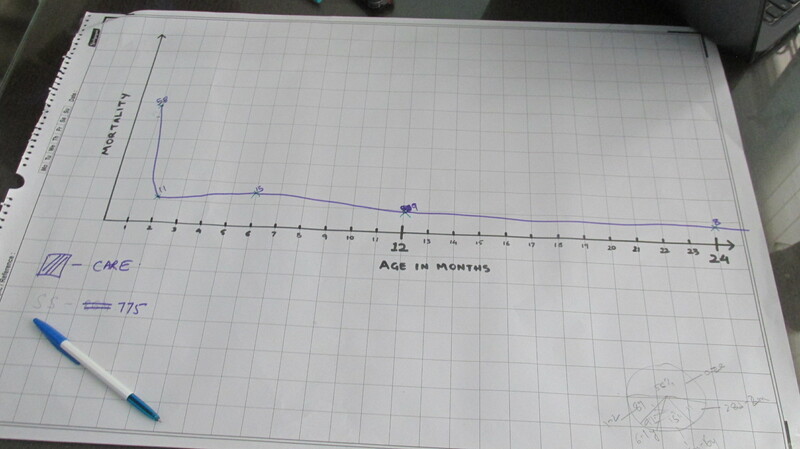 For this purpose we provided the participants with a graph that contained one axis for the timeline of upto 5 years against the other one a mortality scale. We then asked them to draw “a mortality curve” on this graph which we had thought they would create off the top off their heads but wait! Our participant, apart from possessing immense knowledge and experience from field, were men of facts and numbers. They pulled out their laptops, opened a gazillion excel sheets and started marking points on the graph. After a jarringly long 20 mins we had a spot on, accurate mortality curve. Our literature review showed that in Bihar mortality load is highest in the first twenty eight days of life. A child who is born preterm with low birth weight is more susceptible to infections and diseases like pneumonia and neonatal sepsis. The curve that was the product of this activity consolidated that and more. 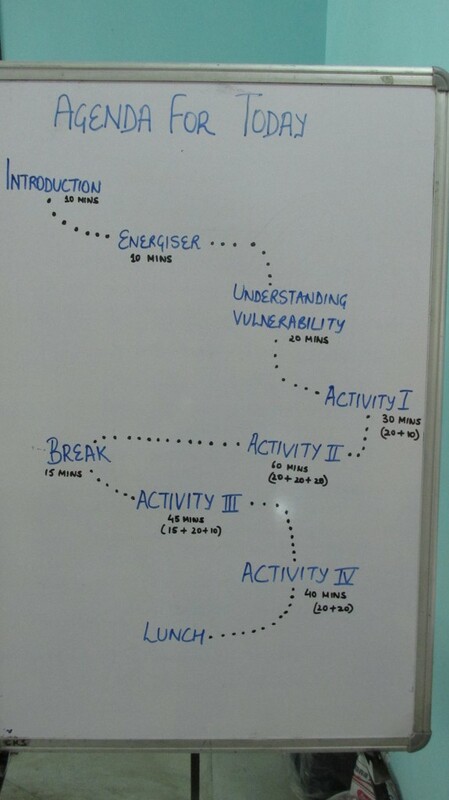 After this the participants had to list out risk factors that perpetuate mortality at different stages of the curve. The results that emerged from this exercise seemed to be somewhat synchronized with what we had gathered during literature review, while at the same time adding to it a lot more detail. However, at the same time it also failed to address certain themes from the literature all together. We were able to create a table that contained the risk factors we identified from the literature segregated into 5 categories of risk; Clinical signs, Maternal health history, Child case history, Familial context markers and Socio-demographic markers. This table was not presented to the participants during the activity but we drew a comparison after they were done listing out risk factors under each stage. Most of the factors from the activity matched those on the clinical signs category of our table. Apart from these a few matched those under the socio-demographic category. However factors emerging from maternal health history and familial context were largely left untouched. The participants showed an inclination to discuss clinical and socio-demographic factors owing to the evidential knowledge they have developed at their field of work. The second activity was designed to form an understanding of how risk manifests in Bihar. We had created four scenarios of children succumbing to mortality and/or stepping into morbidity. The age of the children along with some details of their symptomatology was provided to the participants.They were each asked to map out the journeys of at least two of the four cases by adding details of the child’s socio-economic, cultural and familial background and build on maternal history, delivery and birth, interactions with the health system etc. These journeys were to be created on the basis of their experiences and common observations on field. For this case the following inputs were made to this journey by all three participants individually. Delivery was at a PHC but mother and child left the facility within a few hours. These patterns had also emerged during our analysis of the latest NFHS data where we were looking for indicators of risk at community level. We hope that as we continue to conduct this activity with more participants these common routes of risk will become clearer and stronger. The third activity intended to uncover the practices of rural beneficiaries and the decision making involved that explains their behaviour. This required the participants to collectively add to a list of “actors” that are the people that make (or influence) decisions related to child health care and “factors” that are situations and conditions that in turn affect the decision making. We had provided them with 15 green cards with actors and 8 blue cards with factors (based on secondary research and observations from previous field visits) and some blanks in both colours for them to create various other actors and factors. One new actor card, three new factor cards were created. 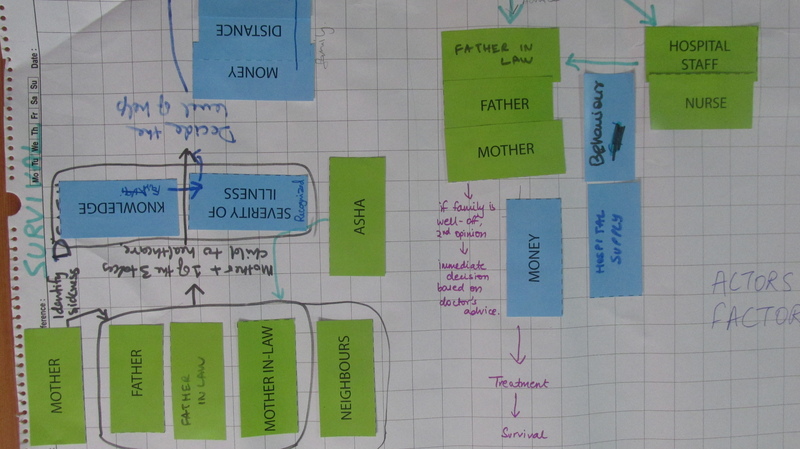 They started by mapping the decision making involved in a case where a child survives. It pointed out the strongest actors in the process and the predominant factors affecting decisions also became clear here (some of them were from the set of new cards). Factors like money, transport and distance play a huge role in decision making and some of them have been addressed and worked on by the government (for example 102 ambulance service). However, when we wanted to move on to cases where the child succumbs to death or slides into morbidity the participants hesitated. They expressed that the ideal route of decision making that saves a life is simpler to understand but the ones that fail to save lives are extremely varied and that it wouldn’t be fair to generalise. Men of facts and numbers like we said earlier! However they offered to share verbal autopsies from the field that we could use to complete the activity. The fourth activity was designed to understand the health ecosystem through a mapping exercise, particularly to gather knowledge around the interplay and individual characterization of the public and private health systems. 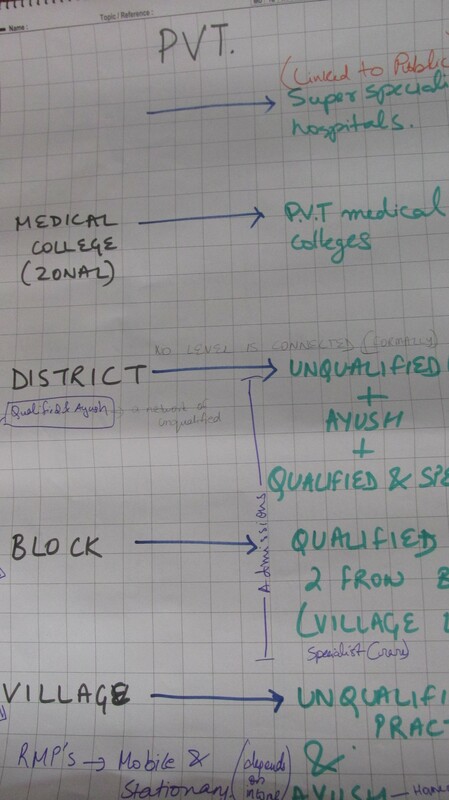 This group activity began with the participants mapping out the layers of the public and private systems using a bottom-up approach, from the village level to the state level, including their complex interactions at various stages. The participants were able to thoroughly explain and traverse around the systemic structures of Bihar’s complex health ecosystem. As an extension to this activity, we had also created a template depicting the SWOT Analysis for the public and private systems. Based on their knowledge and experience, the participants were able to identify the strengths, weaknesses, opportunities and threats in both the systems (public and private). The activities provided meaningful outcomes as all participants contributed willinging to provide a better understanding of the health ecosystem in Bihar. The strengths and weaknesses of the health system stimulated conversations on how the public and private system is perceived by the participants in particular, and the community in general. Brainstorming on opportunities and threats opened possibilities of new interventions and triggered ideas around the existing interventions in the ecosystem. The results of this workshop with CARE participants resonated with the direction we are pursuing and added perspective to it. Numerous research questions had emerged from the literature review and previous workshops which were continuously addressed through these activities. While some hypotheses were validated, others are being explored as we continue doing these activities with various other participants from CARE and Abt Associates. Every day our minds are buzzing with new questions to explore more innovative ways to examine this problem! This workshop helped us go beyond the facts and the figures- it helped us to tap into that which is sometimes of even more value- the instinct of these experts. These practitioners who have been on the field for years, they’re instinct is rooted in experience which is indispensable. The new knowledge that was gathered during this workshop was an explicit byproduct of the ‘facts and figures’ that backed the outcomes of most exercises. May it be the mortality curve, the personas or the hesitation behind elaborating on the care-seeking pathways in cases of morbidity and mortality. In addition, this knowledge will enable us to better understand CARE’s existing data and identify possible opportunities of interventions. As we attempt these activities with different group of experts, the outcomes will change pertaining to their knowledge, experience and expertise. It is interesting to see the similarities in our data with that of the traditional learnings. Despite the slight differences, the nuances, the gaps, there also exists an underlying understanding of vulnerability, of children under 5, in Bihar. We believe this common knowledge around vulnerability holds scope for exploration and consolidation. 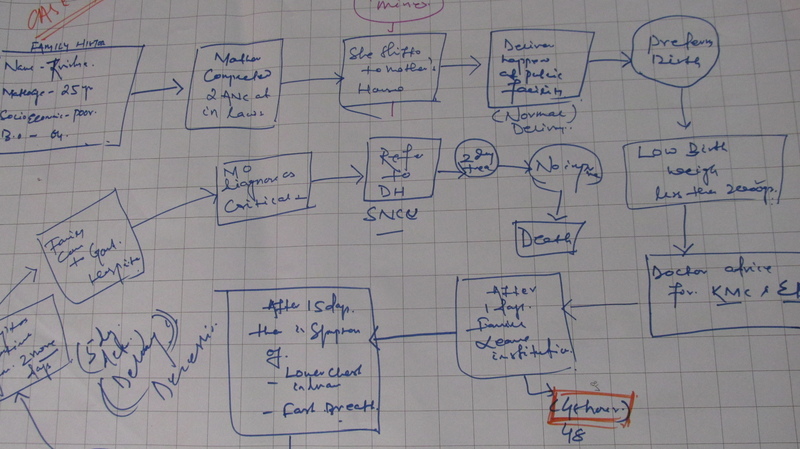 Let’s see if we can draw an evident pattern based on our future learnings. The members from the Vihara Team who conducted the workshop, co-created this blog and are still analyzing and collating outcomes are Bhavya Joshi, Nida Yamin and myself. 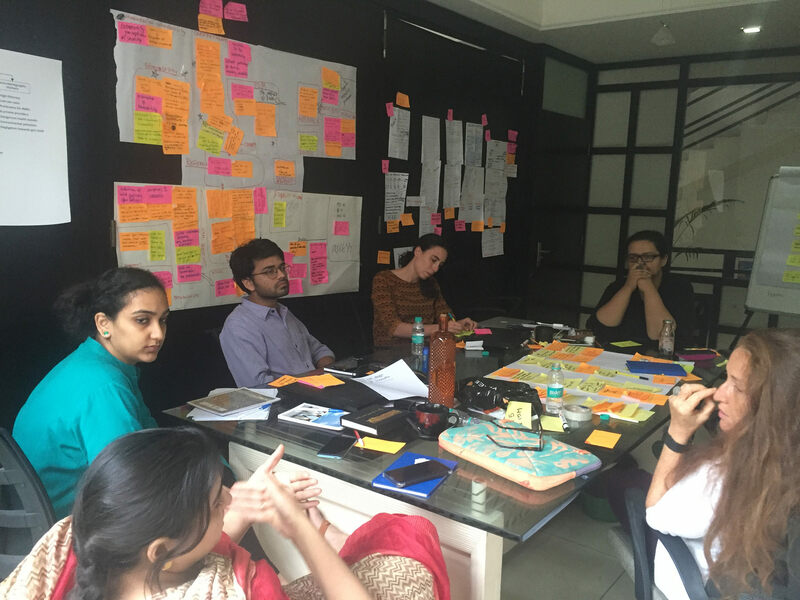 Pratyusha is a Design Researcher at Vihara Innovation Network currently working on the UCDU5M project (User Centered Design for Under 5 Mortality). This entry was posted in Design Challenges, Design!publiC, Health Public, Interesting Ideas and tagged #viharainnovationlab, BMGF. Gates Foundation, child health, child mortality, child survival, CKS, collaboration, Collaborations and partnership, design research, morbidity, U5M, Under five mortality, vulnerability. Bookmark the permalink.